I've had this little elephant in my stamping stash for a number of years now, ever since I was on The Play Date Cafe design team. Paulina of DeNami Design generously gifted our team with her adorable stamps at the time. The sentiment and little flowers are from Inspired By Stamping's Oh, Baby! The yellow Gingham is from Market Street Stamps (oh, how I miss them!). 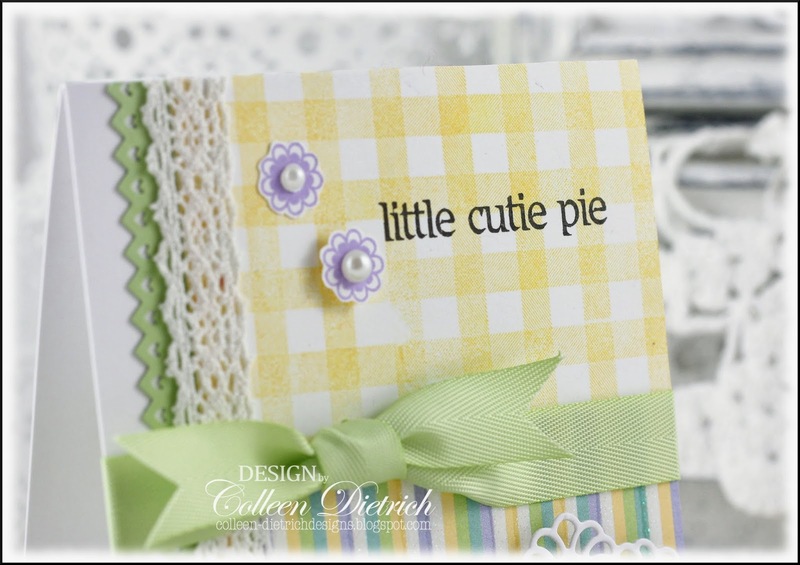 See how the doily die cut extends over the edge of the card? This means I need to use a bigger envelope, and I use an A6 (4.75" x 6.5"). By the way, I found a very useful Envelope Size Chart HERE. I keep a copy near my crafting supplies, as well as in my Evernote program. I've blogged before about Evernote, and I can't say enough good stuff about it. It keeps my stamp, die, embossing folder and punch inventories in an easy-to-use format. I can access the program via my computer, phone and tablet. If I am looking for a particular stamp, or a particular sentiment, I type in the keyword (say, "giggle" for example) and Evernote shows me all the sets I own that have the word "giggle" in them. I've started uploading my recipe cards and magazine pages featuring recipes we like into the program, too. Stamps: flowers, sentiment - Oh, Baby! - Inspired By Stamping; Gingham - Market Street Stamps; elephant - DeNami Design Paper: white - PTI; Pear Pizzazz - SU; stripe, dots - Nana's Nursery - DCWV Ink: Lavender Lace, Barely Banana - SU; Versafine Onyx Black - Tsukineko Fibers: Certainly Celery twill - SU Accessories & Tools: crochet tape - IBS; doily die cut - My Favorite Things; heart border punch - SU; pearls - Queen & Co.
Sooooooooo cute!! LOVING that elephant and the lace!!!!! This card is so sweet! I love the papers you used!! Such a cute polka dotted ellie and just love the soft pastels you used. This is ADORABLE Colleen! As Always- LOVE what you create! 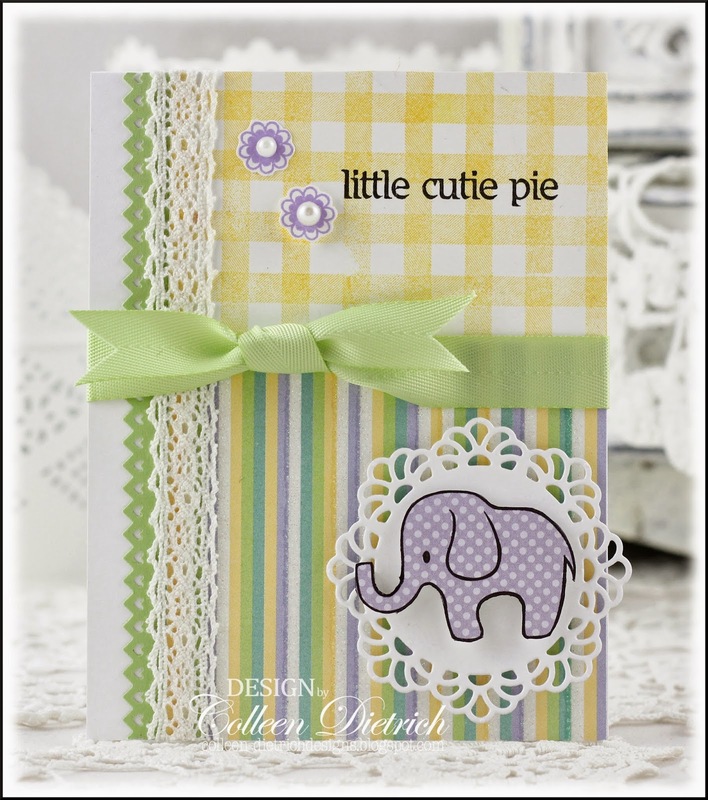 Love the Cute elephant, the striped paper and the yellow checked paper! Fab card, Colleen! Darling card, image, and colors. Guess who loves baby cards? Yes, that would me me! 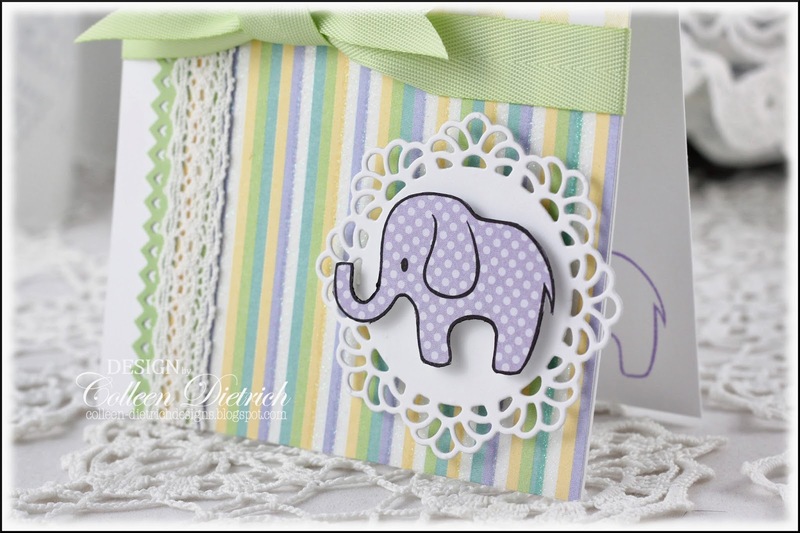 Love the colors and the sweet polka dot elephant. Still need to use my Zoo Babies set from SU! Can't remember if that elephant has polka dots... So many stamps to love! Just love your baby card. The stripes and gingham are so pretty together. Of course, the elephant is a cutie. I just made an elephant baby card. Of course, it won't be posted on my blog for a long time...if ever. This is adorable, Colleen! I love the colors--so cheery! Can you believe--I FINALLY own this elephant stamp! And I do believe I have that Nana's Nursery paper pack, too ;). Sweet! This is fresh and sweet Colleen!! I love your lilac polka dot elephant!! This is super adorable, Colleen! Love the soft colors, perfect for a baby card.